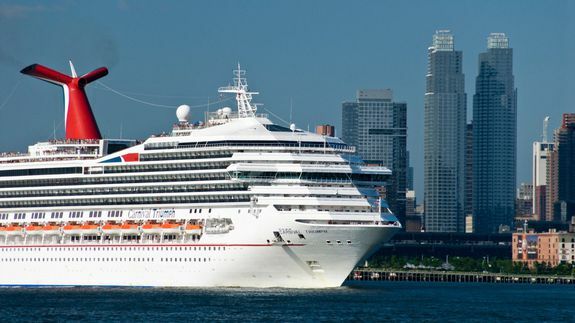 NEW YORK — The world’s largest cruise provider and the Justice Department announced a settlement Thursday regarding access for people with disabilities on 62 ships in the Carnival, Holland America and Princess Cruises brands. Miami-based Carnival Corp. will pay a civil penalty of $55,000 to the government and $350,000 in damages to individuals harmed by past discrimination, the government announced. The settlement is the result of an investigation of complaints by the Justice Department. Among the complaints were allegations that the company failed to properly provide and reserve accessible cabins for individuals with mobility disabilities; afford individuals with disabilities the same opportunities to participate in programs and services, including boarding and leaving the ship; and provide effective communication during emergency drills. Read more..
#AceFinanceNews – LONDON (AP) – Japanese media company Nikkei Inc. is buying the Financial Times as part of an 844 million-pound ($1.3 billion) deal with Britain’s Pearson PLC. The deal announced Thursday is part of Nikkei’s strategy to boost its global reach and also allows Pearson to concentrate on its core global education business. #AceFinanceNews – July.23: Few investors appreciate just how revolutionary the Roth IRA was when it first became available almost two decades ago. Traditionally, retirement accounts have been a method of deferring taxable income, with contributions to traditional IRAs and 401(k)s not included in current-year income, but with eventual withdrawals in retirement subject to income tax. The Roth IRA’s truly tax-free treatment of retirement savings has appealed to millions of investors, but because of income limits on making contributions, many high-income savers don’t have direct access to Roth IRAs. Starting in 2010, the opportunity to create a backdoor Roth IRA became available even to those who were locked out by income limits. Yet with some lawmakers seeing backdoor Roth IRAs as an abuse of the retirement vehicle, you should consider using the strategy now while it’s still available. Let’s take a closer look at the backdoor Roth IRA, why it’s so valuable, and why some people want to make it disappear. Back when Roth IRAs first came into existence, high-income individuals found themselves locked out of the new retirement accounts. Even now, single filers with adjusted gross income above $131,000 aren’t allowed to make Roth IRA contributions, and for joint filers, a limit of $193,000 applies. Moreover, conversions from traditional IRAs to Roth IRAs weren’t allowed for those with incomes above $100,000. The combination of those factors created an insurmountable barrier to high-income savers wanting Roth access. In 2010, though, lawmakers repealed the income limit on Roth conversions. That opened the door to Roth IRAs for high-income individuals for the first time, but it came with a hitch: Most of the time, when you convert a traditional IRA to a Roth, you have to pay income tax on the converted amount. Given how high the tax rates are for these upper-income taxpayers, paying Roth conversion tax isn’t a very attractive proposition. The backdoor Roth IRA gets around this problem by taking advantage of another tactic: the nondeductible regular IRA. Most high-income individuals aren’t eligible to deduct their traditional IRA contributions because of similar income limits, but nondeductible traditional IRAs are available to anyone with earned income. Therefore, the two-step method for the backdoor Roth involves making a nondeductible IRA contribution and then converting that newly created IRA to a Roth. If your nondeductible IRA is the only traditional IRA you own, then the Roth conversion doesn’t create any tax liability. That’s because the IRS recognizes the fact that you didn’t get a tax deduction for your initial nondeductible IRA contribution, and so it essentially gives you credit for that contribution when considering the tax impact of the rollover. For many savers, though, the nondeductible IRA isn’t their only traditional IRA. If you have made past IRA contributions and got tax deductions from them, then the IRS requires you to treat the conversion of your nondeductible IRA as if it came pro rata from all your IRA assets. That will subject part of the converted amount to tax. However, there are a few things you might be able to do to rearrange your finances to use the backdoor Roth IRA strategy. Many employer 401(k) plans allow workers to roll their IRA assets into their 401(k) accounts, and money that’s in a 401(k) avoids the pro-rata tax problem because of its being an employer plan rather than an individual IRA. Similarly, those who are self-employed can use self-employed 401(k) arrangements and provide for the same asset movement to set up their tax-free backdoor Roth. The sense of urgency about backdoor Roth IRAs comes from the fact that policymakers have increasingly seen the strategy as a form of unfair tax avoidance. The Obama administration’s proposed budget for fiscal 2016 included changes that would put a halt to the backdoor Roth IRA by preventing Roth conversions involving funds from nondeductible IRAs or voluntary after-tax contributions to 401(k) plans. The budget proposal hasn’t become law and likely won’t, but in future, lawmakers might well target the backdoor Roth as something that unfairly benefits high-income taxpayers. For now, though, the backdoor to a Roth IRA remains open, and high-income individuals should look closely at their financial situation to see if they can take advantage of it. Having tax-free retirement money available to you can be extremely valuable, and the backdoor Roth is the best — and often only — way for people subject to income limits to get the benefits of this retirement vehicle. If you’re like most Americans, you’re a few years (or more) behind on your retirement savings. But a handful of little-known “Social Security secrets” could ensure a boost in your retirement income of as much as $60,000. In fact, one MarketWatch reporter argues that if more Americans used them, the government would have to shell out an extra $10 billion… every year! And once you learn how to take advantage of these loopholes, you could retire confidently with the peace of mind we’re all after.Simply click here to receive your free copy of our new report that details how you can take advantage of these strategies. Or Apple (up over a mindboggling 6,000% since 2004) when smartphones made landlines irrelevant. Now an industry 99% of us use daily is set to implode… And 3 established companies are perfectly positioned to take advantage of this game-changing economic shift. That’s why I urge you to click below to find out which industry is going the way of the dinosaur… and how YOU can take advantage. TOKYO (Reuters) – The former chairman of Toshiba Corp’s audit committee plans to step down from his role on a government accounting panel, a source familiar with the matter said on Thursday, in the latest fallout from the book-keeping scandal at the Japanese industrial conglomerate. #AceFinanceNews – July.23: The real reason for any deal in this world is cold-hard cash and plenty of it. As in the case of the Iran deal as They agree more than $2 billion of projects with EU companies: deputy minister. Iran has completed negotiations with some European companies wanting to invest in projects in the country following a nuclear deal reached between Iran and world powers this month, an Iranian deputy minister said on Thursday. Some of these negotiations have concluded, and we have approved and granted them the foreign investment licenses and protections,” Mohammad Khazaei told a conference promoting trade between the EU and Iran. “Even in the past couple of weeks we have approved more than $2 billion of projects in Iran by European companies,” he said, without naming any of the firms or providing further details on the deals. SHANGHAI, July 23, 2015 /PRNewswire/ – Today, UnionPay International announced that it will initiate the preferential program over 40 business areas worldwide, according to which the exclusive privileges of UnionPay cards (card number starting with 62) up to 10% discount will be launched by near 1,000 merchants in 21 countries and regions globally, covering more than 10 shopping centers, 12 discount villages and 20 landmark department stores. #AceMarketsNews – HONG KONG (Reuters):July.23: Asian shares edged lower on Thursday as mixed regional data and overnight declines on Wall Street prompted investors to take profits, while the dollar held steady as expectations for a rise in U.S. interest rates were strengthened by buoyant home sales. Financial spreadbetters expected Britain’s FTSE 100 to open around 0.4 percent higher, Germany’s DAX 0.3 percent higher, and France’s CAC 40 to open around 0.4 percent. South Korea’s economy recorded its weakest expansion in six years in the second quarter, battered by a deadly virus outbreak and poor exports, while Japan reported strengthening export growth in June but concern remained over how shipments to China might be affected by its slowing economy. The MSCI’s broadest index of Asia-Pacific shares outside Japan slipped 0.2 percent but was holding well above a near 1-1/2 year low hit on July 8. Tokyo’s Nikkei rose 0.4 percent, helped by a weaker yen, while Australian shares were off 0.2 percent. Capital flow trends suggest money managers are slowly turning more bullish towards the region’s growth prospects within the broader emerging market bloc. Equity and bond inflows turned positive for the week of July 15 in Asia while Latin America posted yet another week of redemptions from both these asset classes, according to EPFR data compiled by BNP Paribas. “Asia remains one of the bright spots in the global economy with China and India remaining committed to a broader economic reforms agenda,” said Kenneth Akintewe, a portfolio manager at Aberdeen Asset Management, which has $490.8 billion in assets under management globally. China stocks extended their recovery on Thursday from last month’s collapse, with the Shanghai Composite index set to rise for a sixth consecutive session, led by gains in blue chips. The Hong Kong market also advanced. Stock markets were subdued by disappointing earnings from global tech giants, led by Apple whose shares plunged overnight, a day after the iPhone maker gave a fourth quarter revenue forecast that was below market expectations. Microsoft also slumped after reporting its biggest quarterly loss. In currencies, the dollar nudged up 0.1 percent to 124.05 yen after rebounding overnight from a low of 123.27 thanks to a rise in U.S. home sales to a 8-1/2 year peak. The euro was little changed at $1.09360 after coming off an overnight peak of $1.0966. “Sentiment towards commodities as a whole has been plummeting as the Fed lift-off timeline narrows and the drive to the dollar returns after six weeks of macro turmoil,” Evan Lucas, market strategist at IG in Melbourne, wrote. The drop in commodity prices has hurt commodity currencies such as the Canadian dollar, which held near a six-year low of C$1.3053 against the U.S. dollar overnight. The Canadian dollar and other commodity currencies could weaken even more if the U.S. Federal Reserve begins hiking interest rates as early as September. The New Zealand dollar, which also probed multi-year lows recently against the U.S. currency, fared a little better after the Reserve Bank of New Zealand delivered a smaller interest rate cut than some in the market had expected and softened its rhetoric on the kiwi following its recent, dramatic fall. The kiwi firmed as high as $0.6654, recovering from a six-year trough of $0.6498 hit last week.